Where today's clients are won. Business Services Finder puts you in front of companies in your local area that are looking for specialists to help them overcome the challenges of building, running and promoting their business in today’s marketplace. As the first and only marketplace dedicated exclusively to firms that serve the needs of today’s business, Business Services Finder gives clients what no search engine can. 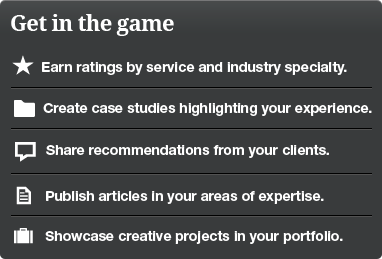 BSF captures everything potential clients need to see – including your ratings, client roster, case studies and articles – in one all-encompassing view through the company profile page. BSF provides meaningful, verified ratings by service and industry specialty based on your reviews, work experience and articles. BSF safeguards the integrity of our ratings system by publishing only vetted client recommendations.